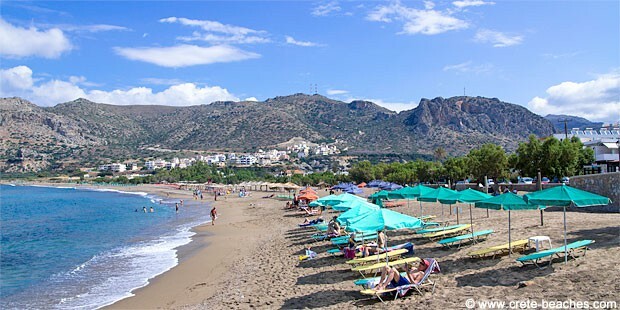 Paleochora is a beautiful small holiday resort in the south-western part of Crete. It is situated on a small peninsula approx. 1,5 hours’ drive from Chania on the north coast. 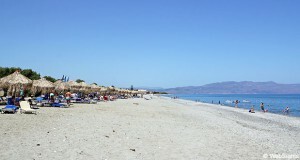 There are two lovely beaches in Paleochora, which each have their individual qualities. On the west side of the peninsula, you’ll find the main beach, a long and wide sand beach with a lovely view of the mountains. The water is clear and shallow, perfect for the children as long as there are no high waves. On the east side, there is a smaller beach with large rocks. It is more quiet here and there is a fantastic view of the white mountains. At both beaches, it is possible to rent sun lounges and sunshades and there is also access to showers and toilets. With its fine-grained sand and shallow water, the beach on the west side is very child-friendly, but there may be high waves sometimes. There are no water sports activities in Paleochora, and thus no noise from motor boats and jet skis. There is a number of restaurants/cafés behind the main beach on the west side of the peninsula. At the stone beach on the east side, there are also a few restaurants. 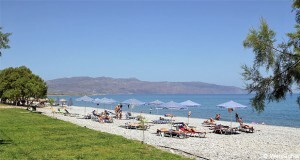 Paleochora is a small and nice holiday resort where many Greeks prefer to spend their holidays. It is nice to stroll along the narrow streets and look at the beautiful houses in the old quarter. Here you’ll also find the boast of the town: the yellow church with the lovely church tower. There are many restaurants, of which several are serving traditional Greek food and seafood. It is also possible to shop in the town, which has supermarkets, bakeries and even a butcher. The hotels in Paleochora are mostly small, whereas there are many private holiday homes.